As Pok?mon Go fever is spreading across the U.S., so too are accidents and all-around craziness caused by the ridiculously popular mobile app. People are even willing to risk their lives to play the game. 21-year-old Michael Baker was out playing the game in Forest Grove, Oregon around 1 a.m. on Monday morning when he was stabbed. But rather than go to the hospital to get treated, he continued playing Go instead. Weatherman Bobby Deskins with WTSP 10 in Florida was live on air when news anchor Allison Kropff walked right across set in front of him and his weather map while looking for Pok?mon. One Brooklyn player was playing in Prospect Park at night and walking toward a lure while live streaming, when he was smart enough to fall into a lake. An upstate New Yorker was playing the game in Auburn on Tuesday night when he drove off the road and slammed right into a tree. Luckily the driver was not seriously hurt, although the same can’t be said for his car. 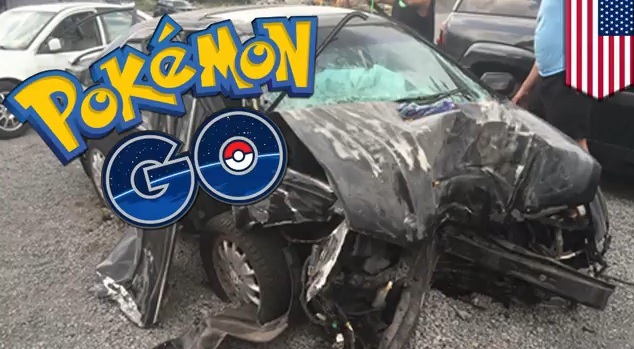 A 15-year-old Pennsylvania girl was hit by a car on Tuesday around 5 p.m. after crossing a busy highway after she had just found a Pok?mon. Wonder how long it will take before Pok?mon Go claims its first fatality? Bets anyone?